Public documents also show that the East Bay Zoological Society, which claims that it’s in desperate need of money and will have to discontinue programs for children if voters reject Measure A1, had spent $248,000 to promote the ballot initiative as of September 30, and wrote checks totaling $375,000 to a political committee it established to support the measure. Attendees of a recent political event say that the Zoological Society’s executive director told the audience that his organization plans to spend $1 million of its own funds to promote Measure A1. Zoo operators illegally posted campaign signs on public property. The Oakland City Attorney’s Office said it was aware of at least one campaign violation committed by the Zoological Society. 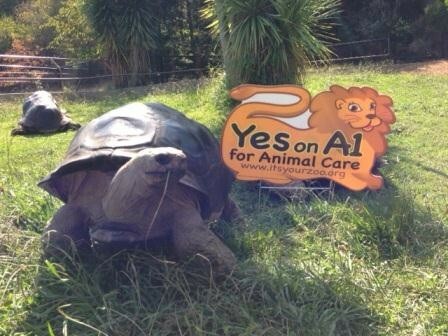 Officials for the nonprofit had posted numerous signs in favor of Measure A1 at the zoo, which is against the law because the zoo is public property — owned by the city. The city attorney’s office said yesterday that it had ordered zoo officials to remove the signs. The Zoological Society also appears to have violated a separate campaign law that prohibits political campaigning on public property. According to public records, the Zoological Society lists its pro-Measure A1 headquarters as being at the zoo, which is also illegal, because the zoo is owned by the citizens of Oakland. The Zoological Society’s actions are akin to a city councilmember operating his campaign for reelection out of his council office in City Hall. “You can’t do that,” noted Ralph Kanz, a former chair of the Oakland Public Ethics Commission who is also an opponent of Measure A1. Moreover, the Zoological Society appears to have violated another section of the contract that prohibits it from using city funds to finance political campaigns. According to the Zoological Society’s federal tax returns, it received $2.8 million annually, on average, in taxpayer funding during its three most recent reportable years — 2008 through 2010. A substantial portion of that total came from the City of Oakland. And tax records indicate that the zoo appears to have mingled taxpayer dollars with other revenues in its general fund before writing checks for $375,000 last month to finance the pro-Measure A1 campaign. Joel Parrott, the Zoological Society’s executive director, did not return a phone call seeking comment for this report. Carl Nichols, a Zoological Society employee who is listed on official documents filed with Alameda County as the assistant treasurer for the pro-Measure A1 campaign, also did not return a phone call. Mark Morodomi, a supervising attorney in the Oakland City Attorney’s Office, said the Zoological Society must keep the city funds it receives separate from funds it is using for political purposes. However, there is no indication in the Zoological Society’s tax records that it has done so. It’s commonplace for public agencies that run ballot measure campaigns to establish a separate nonprofit foundation for such purposes. But the Zoological Society’s tax records make no reference to such an entity. Because it’s a private nonprofit, the Zoological Society does not have to fully open its books to the public. Morodomi was aware of the illegal posting of campaign signs at the zoo, but did not know that the Zoological Society had also set up its pro-Measure A1 headquarters on city property — until this reporter told him about it. Parrot and other Measure A1 proponents have contended that, if voters turn down the ballot initiative, then the zoo will have to discontinue some educational programs for young students. However, the Zoological Society’s tax records show that the nonprofit appears to have plenty of money. In 2010, the most recent year in which data is available, the Zoological Society reported to the IRS that it ended the year with a $6.1 million net surplus. And from 2008 through 2010, it reported net surpluses averaging $2.6 million a year. Tax records also show that Parrott’s total compensation in 2010 was $203,500, which was substantially higher than Oakland Mayor Jean Quan is paid. Update: Here is the Zoological Society's 2010 tax return and its most recent Measure A1 campaign statement.